Cereal chicken goujons sound less then appetising, I won’t lie, however they are pretty tasty actually! Plus using the cereal to coat the chicken and oven cooking they are a healthier take on chicken dippers/nuggets. These are a great, kid-friendly recipe and completely adaptable. What I also like about this recipe is it’s use of dairy free milk rather than egg to help the coating stick to the chicken strips. This method has worked well with other recipes I have posted before, in particular my Chicken Kiev recipe. 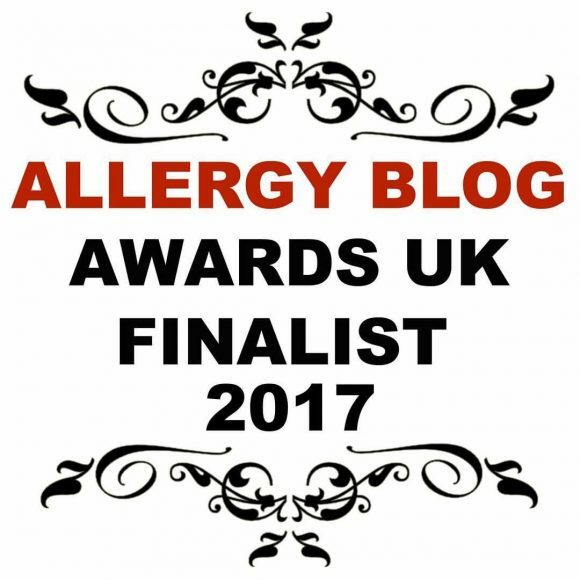 I chose to use bran flakes as they are little one’s favourite at the moment. Yes, I know it’s a little strange for a two-year old to like bran flakes, but I’m not complaining! You could easily swap them for a gluten free option or rice crispies, corn flakes, even Weetabix would work. The protein could also be swapped. Why not try turkey strips, fish (fingers) or perhaps pork? The protein could also be cut into chunks to make nuggets if you prefer. It really is a flexible recipe! 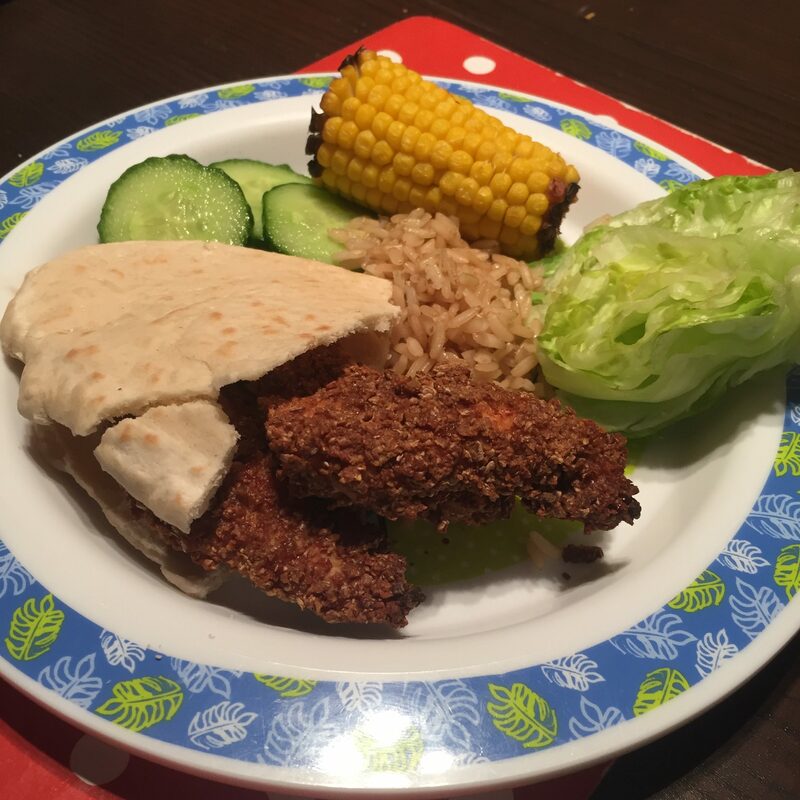 I served them in a pitta pocket with wholewheat rice, salad and little one’s all time favourite- corn on the cob! They are also perfect to pop into a picnic and eaten cold or served with homemade wedges with baked beans for a Friday treat! Yum! I prepared the goujons in the morning and popped them in the fridge to cook for dinner later on, which is a great time saver. You could also freeze the goujons before cooking for a midweek meal at a later date. Make sure you defrost them thoroughly in the fridge before cooking, following the cooking instructions below. Preheat the oven to 200 degrees and lightly grease a baking tray with oil or dairy free spread and leave to one side. Place the dairy free milk in a dish/bowl and mix the flour, paprika, onion granules and garlic granules in another bowl. Crush the cereal in a bag (you could use the original cereal bag) until you have small, even sized pieces to coat the chicken. Take a few chicken strips and roll them in the flour/ spices mix until coated. Lightly tap off the excess flour before placing the strips into the dairy free milk. Again, lightly tap off the excess milk before popping into the bag of cereal. Close the top of the bag and lightly shake to coat the chicken strips. Remove the chicken goujons from the bag and place on a plate to cook later or straight onto the baking tray ready for cooking. Repeat steps 2 - 5 until all of the chicken strips are used up. You could now pop the plate into the fridge for cooking later or pop the baking tray into the oven. Cook the cereal chicken goujons for 20-25 minutes, carefully turning halfway through. Check the chicken is thoroughly cooked and piping hot before serving. Dairy, egg, nut and soya free. Can be gluten free too if gluten free flour and cereal is used. 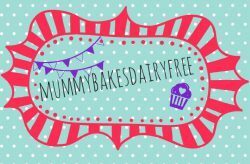 Previous Post Tesco Free From Cake Mix – Review & Creations! Next Post Pancake Day Recipes – dairy, egg, nut & soya free. We make something very similar, and it’s always such a treat for the children. They love dipping their goujons in ‘free from’ mayo with a bit of lemon juice 🙂 Thanks for joining in with #FreeFromFridays.